Frost seeding is broadcasting forage seed onto the ground surface while the ground is still frozen in the spring. The principle is that repeated freezing and thawing of the soil surface causes surface cracks in the soil which allow seed incorporation. Frost Seeding of Forages Farmers have reported that frost seeding works 60 to 70 % of the time. They feel frost seeding is worthwhile it because of the cost saving from not needing a seeder. While frost seeding is a less expensive method of seeding forages than using seeders, it is also riskier than seeding with a drill because seed-soil contact is less good and produces less uniform stands. Frost seeding can be acceptable for pasture improvement but not for establishing pasture or hay fields. Seed can be distributed by broadcast seeders that are either tractor- or ATV-mounted or hand-held or mixed with fertilizer and applied. The optimum is to broadcast seed early in the spring after the snow is gone but while the ground is still frozen. Frost seeding on top of snow, especially with fertilizer, is not recommended because rapid snow melting may cause the seed to be washed off the pasture. Frost seeding earlier than March will also result in seed loss to birds, rodents, etc. Frost seeding works best if pasture residue has been removed prior to broadcasting the seed to allow the seed to reach the soil surface. Residue removal is best done by grazing late the previous fall. Residue can be removed by grazing or burning in the spring but either may delay seeding. Frost seeding is not recommended for sandy soils because the freezing and thawing does not incorporate the seed. Though often not necessary, any action to incorporate the seed, such as allowing cattle, sheep or horses to walk across the seeded area or disking will increase stand establishment success. Frost seeding works best for legumes and grasses that germinate rapidly and at low temperatures. Red and white clover is the easiest to establish but we have also had some luck with birdsfoot trefoil. Frost seeding alfalfa is not recommended because it does not germinate at as low temperatures as the clovers. 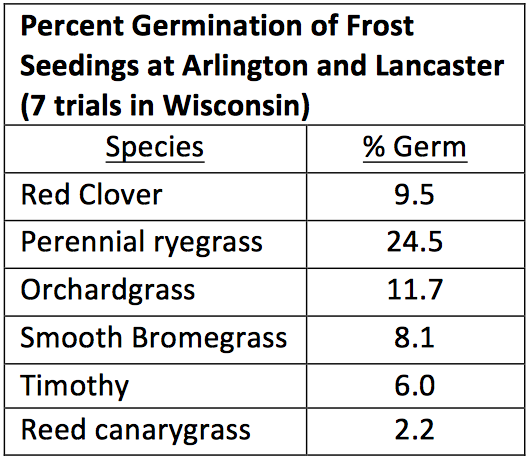 Frost seeded Italian (annual) ryegrass and orchardgrass have high success rates. Other grasses have been frost seeded with varying success. The other key to successful frost seeding is to reduce competition to the new seedlings as they are starting out. It is critical to graze or mow the pasture as the seedlings begin to emerge and whenever the grass gets 8 to 10 inches tall. Some have felt the mowing or grazing would hurt the new seedlings. However greater damage is caused by the shade from the established species if it is not removed periodically during the seeding year.